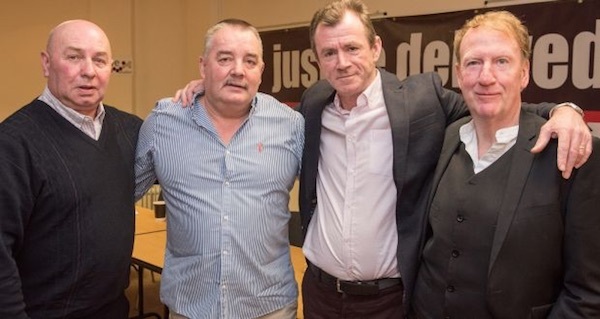 Four Derry men wrongly accused of killing a British soldier have accepted an out-of-court settlement from the PSNI after four decades of fighting for the truth about police brutality, threats and a shocking conspiracy to pursue a miscarriage of justice. The men, known as the ‘Derry Four’, were accused of an attack which killed British Army Lieutenant Steven Kirby in February 1979. Michael Toner, Gerard Kelly, Gerry McGowan and Stephen Crumlish (pictured, left to right) were all aged 17 at the time. They fled across the border when it became clear they were going to be convicted despite protesting their innocence. In 1998, all charges against the men were dropped and they were able to return north. PSNI Assistant Chief Constable George Clarke said this week that police “acknowledge there were significant shortcomings in the treatment of the men involved in this case and we recognise the distress that this has caused them”. The four teenagers, all from Circular Road in Creggan, have spent four decades maintaining their innocence. At the time of the arrests, the four were detained at Strand Road PSNI (then RUC) barracks for three day, and were denied access to lawyers, legal advice and their families. They were subjected to intense physical and verbal abuse by the RUC men who interrogated them. As a result of the treatment they received at the hands of the police they signed false confessions. As the trial of the four young men approached great efforts were made in Derry to halt the false prosecutions. But two days into the proceedings the four received advice that because of the nature of Diplock Courts with judges sitting without juries, their defence was pointless. Next day, the men left Derry and headed across the border and to a life in exile. A long and arduous campaign for justice unearthed evidence of tampered statements, police brutality, and contining police threats against the families, as well as an overwhelming amount of exculpatory evidence. But it was only in December, 1998 that the Director of Public Prosecutions confirmed in writing there would be no prosecution, on any charge, against any of the four. In 1999, the acquittal was followed by an other directive that there would be no prosecution in relation to the four men leaving Ireland during their 1980 trial. “The 1998 acquittals simply confirmed publicly that and without doubt the innocence of my clients. What they did not have however was the truth about how this miscarriage of justice had occurred or had been allowed to occur. They have now spent another 20 years searching for that truth,” said their lawyer Patricia Coyle. At an announcement in Derry on Tuesday Paul O’Connor from the Pat Finucane Centre said justice delayed was justice denied, and that members of the RUC had escaped sanction or prosecution for their actions. Gerry McGowan had been offered professional terms with Leicester City FC when he was falsely accused. It not only ended his dreams of being a professional footballer saw him embark on a 40 year campaign to clear his name and those of his friends. On Tuesday in his home place of Creggan, a place he and his co-accused had been forced to flee, an at times emotional Mr McGowan read out a statement on behalf of the ‘Derry 4’. The statement said: “On behalf of the Derry Four we would like to thank our solicitor Patricia Coyle and those at Harte, Coyle Collins who have been with us since 1998 and helped secured our acquittal 20 years ago. “We would like to thank Paul O’Connor and Sara Duddy from the Pat Finucane Centre, and all their colleagues over the years who have supported us. “We thank our families who have endured this painful injustice with us over the past forty years. They have stood by us throughout, and we remember our loved ones who are not here today. “We have endured a number of dark days over the past forty years. It has taken it toll on our health and our families, but we are now looking forward. “This compensation will not undo the years of hurt and pain inflicted on us and our families, however it allows us to look to the future and we feel some sense of closure that the State is finally acknowledging their wrongdoing.